Global Override is a premium add-on for Better Notifications for WordPress. You can purchase it here. Choose whether you’d like to override an enabled notification or a disabled notification on a per post / page / custom post type basis. Choose whether to disable or enable that notification on a per post / page / custom post type basis. Override the Users / User Roles / Email Address or Custom Fields shortcodes (when used in conjunction with the Send to Any Email add-on) that you want the notification(s) of the post / page / custom post type that you’re editing to be sent to. This add-on can override all post, page, and custom post type notifications but not transactional notifications. It also works with all other BNFW add-ons that create new notification types, so if you also have the Custom Fields add-on installed, you’ll see new options allowing you to override any custom field notifications that you may have set-up too. Add a new or edit the post / page / custom post that you want to override a notification for. On the left, you’ll see a new meta box called Notifications (see screenshot above) showing all enabled notifications. Choose whether you want to override a particular notification by ticking the corresponding ‘Override’ checkbox. Choose whether you want to enable or disable the notification for this post / page / custom post. The default setting is determined by whether the notification under Notifications > All Notifications is either enabled or disabled. You can then choose to enable or disable this notification. You can then override the Users / User Roles for the notification for this post / page / custom post type only too. When viewing the All Posts / All Pages / All *Custom Post Type* screen, you’ll see a new column called Notification Overridden that lets you know if a post is overriding the global settings in one of your notifications. It won’t tell you which notification it’s overriding, but it’ll help you get started on tracking it down. Please Note: After changing the options in the BNFW Notifications metabox and pressing Update, it might trigger any Post / Page / Custom Post Type Updated notifications that you may have set-up. This is standard WordPress behaviour and, to my knowledge, can’t be changed. 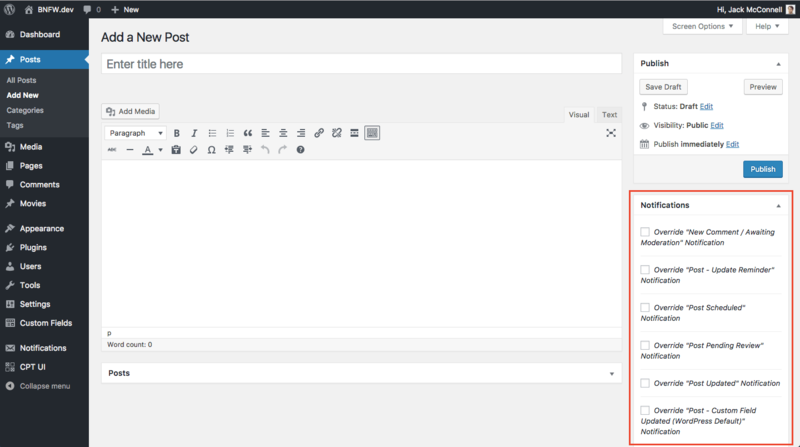 Occasionally, you may see a custom post type or plugin that adds a screen to the WordPress Admin which will also display the Notifications meta box. If you see this and don’t want it to show on a particular page, you can use this filter to hide it.